Mon. - Sat. 11:00 a.m. - 9:00 p.m. Closed Sundays. Authentic Peruvian food on the Outer Banks! Welcome to Shaddai, the Outer Banks' first Mexican-Peruvian restaurant! 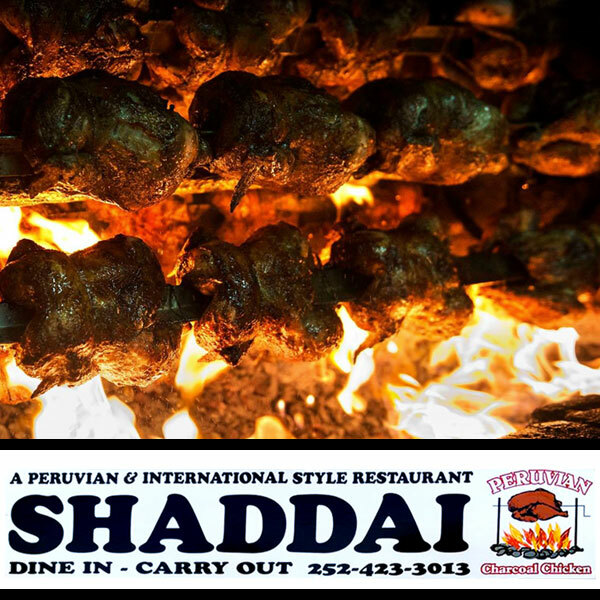 Located in Manteo on Roanoke Island, Shaddai is an authentic Peruvian and international-style restaurant specializing in pollo a la brasa, a Peruvian style charcoal rotisserie chicken. This amazing dish is one of the most popular meals in Peru! We also offer a delicious selection of Mexican and American food, local seafood dishes, creative daily specials, house-made desserts, as well as a variety of traditional Peruvian beverages. Try our horchata, or our chicha morada - a sweet and colorful beverage made from purple corn, fruit, and spices. While you are here, browse our grocery section for specialty spices, salsas, candies, drinks and more! Guests can join us in our spacious and comfortable dining room, or take your order to go. We are family-owned and operated, and family-friendly, offering a full kids menu for the little ones. Give us a call, or stop in today for a tasty and authentic meal. We look forward to welcoming you to Shaddai.